Five professional speakers all in one place to energize you in every aspect of your life into 2019 and beyond! First class service, delicious food and a motivational experience that inspires and enlightens. 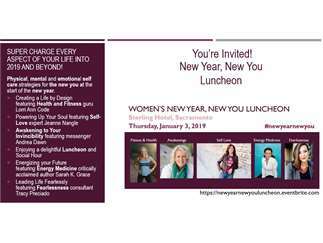 You're invited to this unique luncheon retreat for busy women ready to super charge for the new year. Start 2019 on the easy track with this expert speaker event featuring proven physical, emotional and life self-care strategies for the new you. This highly interactive experience has it all, professional speakers, food, movement and fun. Cost: All of this is included for one special rate $125.00. Seating is limited, event will sell out. Invest in your future with a large dose of inspiration and expertise.